Join Frassati Fellowship of NYC for adventure and service as we share the love of Christ on an 11-day mission trip in Lima, Peru! 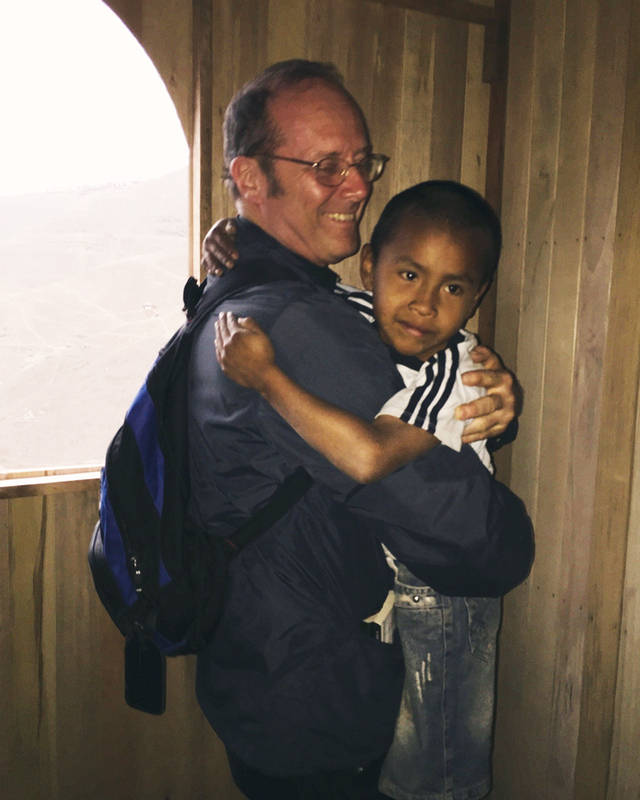 We will serve the community of Laderas de Chillon, a shantytown along the outskirts of northern Lima. 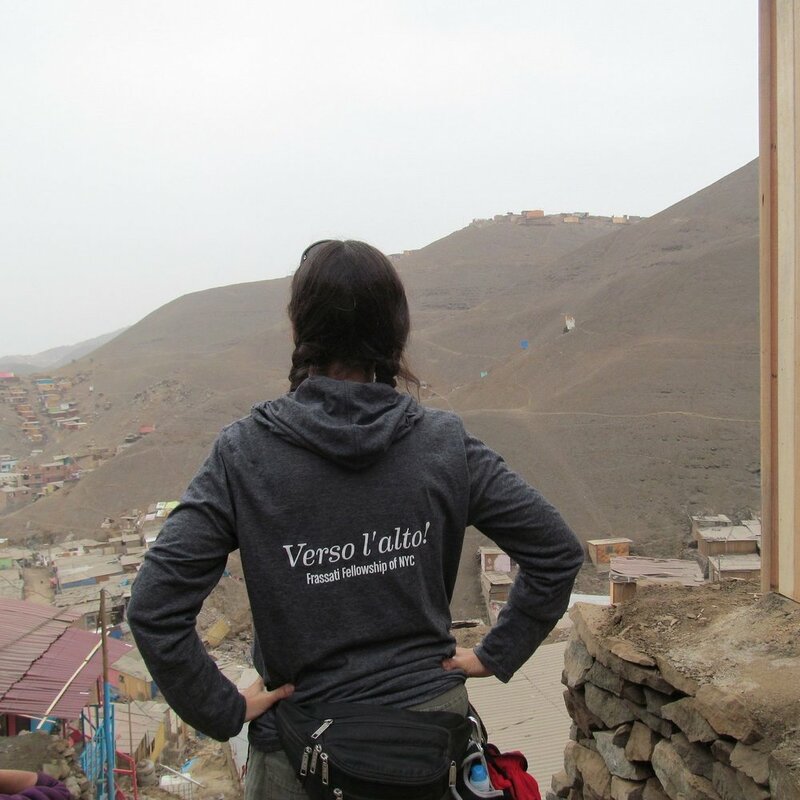 Laderas is a community Frassati has served over the past four years through two previous trips. Once more, we will build homes, visit the sick, share the beauty of the Gospel, and join in the lives of the community. Mass, Holy Hour, and service projects will be part of our daily routine as we serve our brothers and sisters in Christ and also seek to be the hands and feet of Jesus. We will be accompanied by several Franciscan Friars of the Renewal as well as Catholic evangelist and convert Barbara Heil, from His Heart Ministries. At the end of our trip, we will travel to the mountain cities of Cuzco and Machu Picchu for hiking and adventure in the spirit of our patron. Our last day will be spent with a tour of Lima, which will include visits to the convents of St. Dominic and St. Francis where the relics of St. Martin de Porres and St. Rose of Lima are housed. Space is limited and is on a first-come first serve basis. Fundraising support is available. To register, click here. Contact missions@frassati.nyc with any questions.If you've never been on a mission trip, we invite you to join us! Curious to see what it's like? Check out our 2015 trip here. Please consider supporting our mission by clicking here. As you all know, we missionaries returned safely to JFK this past Sunday evening. We are thankful for the safe trip the Lord granted us. Now adjusting back to normal life as it were, we reflect fondly and with much gratitude for this blessed time we spent together. Despite the rigorous schedule (of 12+ hours most of the days), challenging manual labor, and sometimes unpredictable schedule, we somehow managed to sleep each night with a healthy exhaustion of earning a good day's work. We realize what a luxury it is to have a warm place to sleep, a roof above our heads, food in our stomachs, and bathrooms with actual running water and a sewage system (more than just a hole in the ground on top of a hill). What a blessing it was to be able to receive what was due when so many of the people of Laderas put in the same 12+ hour days, often more, manual labor and yet with so much uncertainty of their pay, shelter, and the next meal. Our last day in Peru (Saturday) was spent walking around the city of Lima. We had the privilege of celebrating a private Mass at the Church of Saint Rose of Lima, the very place where she grew up. Across the street was a small, white building where St. Martin de Porres was born. What a gift it was to physically walk in the footsteps of these great saints-- who loved the poor and served the sick. Sitting in the large St. Rose of Lima Church, we could hear the muffled noise of horns blaring and traffic driving by-- the sounds of the world trying to pull our focus away for Christ as is often the Christian struggle. And in a cosmopolitan city like Lima where the face of poverty looks quite different, how easy it was to forget our brothers and sisters in Laderas whom we had left just 24 hours earlier. Visiting the convents of St. Francis and St. Dominic, we saw paintings of Dominicans and Franciscans together as well as books that were hundreds of years old. They were some of the first books brought over of the Faith. Much time and effort was spent by the early Dominican and Franciscan missionaries of Peru translating the Faith into Quechua, one of the aboriginal languages and the most predominant native language in Peru today. We marveled at the fact that these carriers of the Faith traveled all the way to this land, to seek the stranger, to bring the good news of the Gospel of Christ to all the corners of the earth. We ended the day with Mass at the retreat house and a farewell Peruvian dinner by the ocean. Some of the missionaries even dipped their feet into the Pacific. Now back in our homes-- NYC, Ontario, Miami, Buffalo, we know God continues to call us forth in this missionary spirit. Whether we are going off to law school like Liz or returning to serving in the United States Marine Corps like Captain George Russo, we continue to carry the intentions of all our supporters as well as the needs of our brothers in sisters in Laderas with us. We pray that the seeds planted and flames lit will bear much fruit and continue to illuminate this world with the light of Christ. We thank you friends, family, and supporters for enriching this trip and making it possible. We thank our five amazing priests - Fr. Dominic Bump, OP, Fr. Innocent Smith, OP, Fr. Rosado Adaly, Fr. John Anthony, CFR and Fr. Agustino, CFR - for your guidance, covering, patience(! ), and making Christ manifest even moreso through the sacraments-- the outward signs in simple things like bread and wine, which are instituted by Christ to give grace. With today as the Feast of the Assumption, we are reminded that we are a pilgrim people. And like in the procession following Mass, we move forward in this life with a joyful pace among our fellow pilgrims knowing that we come from God and we are moving towards God with the care of our Blessed Mother, the intercession of the saints, and the prayers of our patron Blessed Pier Giorgio Frassati. Praise be Jesus Christ now and forever. Mission complete. Thanks be to God. We are safely here in San Isidro, a district in Lima, at a retreat house called Casa de Espiritualidad Hermasie Paget. Yesterday was our last day in Laderas. We brought all the donations from so many of you to the community. Our roofing team - Paul and George Russo, Jair, Edward, Paul Born, and David put the last roof on the fourth house for Elvira. The rest of us were split painting a termite protector as well as paint primer on the four houses. Some of us also spent the day playing with the local children and helping with their homework. Those of us who were on home visits spent the morning ascending and descending the hills of Laderas as we went from home to home offering blessings, rosaries, and prayers. One of the local boys, Jose, accompanied Fr. John Anthony, CFR on the home visits and knocked door after door. Fr. John Anthony met an elderly Andean woman who was not well. Through a translator, he heard the woman's confession in Quechua and gave her an annointing of the sick. In the afternoon, the missionaries gathered together at the small chapel in "Manzana Z" and proceeded to visit each of the houses we completed. We first visited Ana's house first where we gave her a "Sagrada Familia" statue and a small framed portrait that read "haz siempre uno buena accion" made by one of our missionaries. Then one of our priests proceeded to bless the home. The families were overwhelmed with joy as were we, and prepared popcorn and soda for us all. They were so happy and at the same time sad to see us go. We repeated this same process at Manuel's new home, Angel's new home and finally Elvira's new home. We closed the day with dinner at "el comedor". We where treated to a delicious meal that included "Lomo Saltado" and "Picarones". Then our priests and servers celebrated two community Masses. One Mass in "Manzana Z" chapel and the other at a small, colonial-style chapel called "la Hacienda". When we arrived there many were lined up outside waiting to come in. A few of us walked the neighboring area, inviting the children playing outside to join. With some encouragement, they decided to join and sat right in the front. After the Masses, we said our farewells to the ladies of Laderas who have been our guides and partners. We exchanged many embraces, some tears, and also words of future visits. This morning, we arose early for a 6am breakfast. We departed Cruz Blanca, our basecamp for the week, and headed for Chaclacayo. Around 9:30am, we pulled up to Hogar San Francisco de Assis, a home and hospital for sick and disabled children. We spent the day playing games with them and provided a KFC lunch. Yes, that's right, KFC. We know that may not seem like a treat, but Dr. Lazarra, who runs the home, assured us it would be for them. The Hogar was started by Dr. Lazarra, a native of Florida, to provide medical care for children who had either been abandoned, abused, or whose families could not provide it for them. Currently the Hogar is home to 41 children. For children who have families, they will return to them once they are well enough. We celebrated Mass with the children as well as Holy Hour with lots of Spanish hymns lead by Stephen, our resident Frassati musician and also Fr. Agustino, CFR. We recall emailing Dr. Lazarra eight months ago and asking him about bringing a group of 30 visitors for one day. He replied "We've never had a group that size, but let's try it." The day was a blessing for all of us. It was a different type of mission work. Though we weren't necessarily building something concrete to give or share, it was a privilege to receive so much love from these little ones who bare many different crosses. After leaving the Hogar, we drove to central Lima and had dinner at a commercial center right on the water. It was a startling contrast to be back in a metropolitan area-- where food and water was available anywhere and bathrooms were accessible. How easy it is to forget of the sufferings of others when you cannot see them-- of the families in Laderas who share a common outhouse, no sewage system, and where a bottle of soda is a luxury. As Fr. John Anthony, CFR told us in our last formation before this trip, "God uses experiences like these to plant seeds in us". As we approach our last day, we reflect and meditate on the ways in which God wants these experiences here to shape us, change us, and continue to propel us in our missionary spirit wherever we may be. Thank you all again for making this trip possible. Please know we hold you all in our prayers, especially tomorrow as we have the privilege of celebrating a private Mass at the Church of St. Rose of Lima. We spent Monday continuing work on the four different homes. We met some of the families who would be living there. Home 1 is Elvira's home. She has two boy's age 3 and 7. Home 2 is for Anna. Home 3 for Angel, and Home 4 for Manuel. As we worked throughout the days, some of the families made us popcorn, and even bought us a local Peruvian soda called Inca Cola. To put things into perspective for us, Sister Susana shared that the average daily wage for a taxi driver is around $10.00 US. Many of the families for which we are building the homes do not have regular work, and yet their generosity and graciousness to us is unwavering each day. They greet us with warmth and joy. Several of the family members will often sit closely to just watch the work (for a few hours). To us it may seem like a boring sight, but to them, they are watching their very home built before their eyes. We ended the evening with fellowship and reciting night prayer together around a bonfire on the beach. It's incredible to think of all of us on a different continent and at another ocean. On Tuesday, we finished all the perimeter walls and most of the partitions and started erecting them to form the various rooms of the houses. We also stayed with the community into the evening to celebrate Holy Mass at 2 different locations. Prior to Mass the ladies of "el comedor" made us a delicious dinner. They are the ones who cook for the that part of the Laderas community, feeding an average of over 375 people per day. One group walked with Fr. John Anthony, CFR and Fr. Dominic Bump, OP to one of the many areas of Laderas hungry for the sacraments but lacking a chapel. The ladies of "el comedor" worked with some of the locals to identify a place for Mass, and before we new it, we were in a small building with an alter being set up for Mass. The building was actually a community center that doubled as a bar. It had dirt floors, and plastic chairs which we used for the community. We removed any alcohol-related signage and had an intimate Mass within 15-20 people local to that area. In another part of Laderas, Fr. Agustino, CFR and Fr. Innocent Smith, OP celebrated another Mass. This is a new area that is incredibly poor, where most of the folks have very little shelter. There is also no chapel, but the ingenuity of the people of Laderas never fail. Underneath some tarps and with a small, simple table, a beautiful Mass was celebrated. Meanwhile, Fr. Rosado and a few of our missionaries did street evangelization, inviting folks to come to the Mass. We ended the day with a modest surprise celebration for Fr. Dominic for his feast day. Today, we started applying a wood protector to the walls of the homes and adding the roofing. We spent the morning carrying sheets of tin roofing to each sight, along with more wood, primer, and a 25kilo bag of paint. We worked rapidly, and we were able to put roofs onto two of the houses. During our building, we had a small group visiting a "Cuna," a local daycare center set up by the community. They spent the morning with the children and helped them with their homework in the afternoon. A few other missionaries also accompanied priests on their home visits. We learned even mores what a luxury basic health care is. We learned of one young woman who had to have a simple operation but has to wait until December. When Fr. Agustino asked her why she had to wait so long she replied saying that she needed that amount of time to save for it. Tomorrow is our last day in Laderas. We ask for your prayers for a productive day so we can finish these homes for the four families. We also ask you to keep in prayer all the people and families we have met, and also that local governments and institutions may continue to work to make health care available to the poorest of the poor. We continue "steadfastly in prayer, being watchful in it with thanksgiving; and pray for us also that God may open to us a door for the word, to declare the mystery of Christ". Thank you again for your support. Buenos noches desde Cruz Blanca! Yesterday (Saturday), we arose at 6am and began with Holy Mass and morning prayer at 7am in the chapel. Afterwards, we ate breakfast in community and departed for Laderas. We broke up into three groups and spent the day nailing together the remaining perimeter walls of homes 2 and 3 and also started on the perimeter walls for home 4. We let the cement foundation from home 1 that was mixed and poured the day before continue to set. At lunchtime, we grouped together at el Centro -- a small community center with a multipurpose and a small classroom/library on the second floor. It's our base while we are in Laderas. It is also adjoined to one of the small chapels within the community located in "Mazana Z". Together we prayed the Divine Mercy Chaplet and then headed back to our worksites. The majority of us spent the rest of the day finishing the perimeter walls for sites 2 and 3. But a small (yet mighty) group of missionaries started bringing materials up to house 1. They made more trips than they can count up and down the mountain side, carrying the tongue and groove planks for the perimeter walls, which we will use once the cement finishes setting. We departed from Laderas and came back to Cruz Blanca. We ate dinner together and ended the night with Holy Hour, night prayer, and small groups. Today, Sunday, was our community day in Laderas. We began the day with 7am morning prayer and departed for Laderas. Our five priests, Fr. Agustino, CFR, Fr. John Anthony, CFR, Fr. Innocent Smith, OP, Fr. Dominic Bump, OP and Fr. Adaly Rosado celebrated Mass for the community. They were received by an incredible amount of warmth and enthusiasm from the community. After Mass, many the priests were asked to bless everything from rosaries to cars. We spent the afternoon in fellowship and recreation. One group played volleyball. We walked through the streets and before we knew it, a volleyball net was tied to a telephone pole and house, and we had a volleyball court. We played with girls as young 10 years old, and couldn't come close to any of their serves. Another group played soccer with the men, and a third group played games with the children-- parachutes, jumprope, and face painting. On our return to "el Centro", we were greeted by Spiderman (Jair), whose spent the afternoon being a superhero with the children. Around 3:00pm, we descended the hills and returned to the main church. There we had a Frassati Holy Hour with Stephen our resident musician. It was an afternoon of formation and with teens and young adults (ages 14-21). Fr. Rosado and Fr. John Anthony gave formation talks while Jair and Paul Russo gave their testimonies. Fr. Agustino gave a "ferverino" during the Holy Hour while Fr. Dominic and Fr. Innocent heard confessions. It was a powerful experience for us all. At 5pm, Fr. Adaly and Paul Born departed for another hillside to celebrate/serve Mass (a request we received just 2 hours earlier from another part of Laderas who only receive Sunday Mass twice a month). At 6pm, we departed from Laderas while Fr. Dominic and Fr. John Anthony stayed behind with one of the Fraternas so they could celebrate yet another Mass at 7pm (another request we received just a few hours before). Edward also stayed with them in order to serve the Mass as an altar server. We closed the night with Evening prayer, dinner, night prayer and a game of dodgeball. All is well here thanks to our Transfigured Christ. We labor on knowing that through any adversity we may face "Christ always leads us in triumph, and through us spread the fragrance of the knowledge of him everywhere" even in our own small way. Hello from Cruz Blanca in Lima, Peru! This is our home base during our time in mission. We met bright and early Thursday morning at JFK airport for a 7:35a flight. With one quick stop in Bogota, Columbia, we landed safely in Lima with all of our bags also managing to make the short connection. We had a warm greeting by the Fraternas, the group of sisters who are our mission partners and hosts here. We piled all our suitcases, along with the many clothing and supply donations from so many of you, onto a large bus and headed to Ancon, a northern region of Lima where Cruz Blanca camp is located. True to it’s name, a large white cross greets you, which can also be seen from the sea. We celebrated Mass in their open-air chapel, had dinner, and fell fast asleep hearing the waves of the ocean crashing. This morning, we awoke just before 6am to prepare for morning prayer and Mass. After our first breakfast in community, we piled onto our bus and headed to Laderas de Chillon, the shantytown where we are doing our mission work. We prayed the rosary on the way and learned of the history of Laderas. Once in Laderas, we met the women of “el comedor”, a main soup kitchen in Laderas staffed by volunteer women who prepare more than 350 meals each day. Afterwards, we split into 3 groups. The men formed one group, and their project today was to lay a concrete foundation for one of the four homes we are building. But before they could pour the cement, they had to mix it. And before they could mix it, they had to bring all the materials up the mountain to the site where the home will be built. After carrying several 45 kilo bags on their backs and shoulders, they formed a human chain and spent the rest of the morning passing sand up the mountain side. The women split into two groups and spent the day hammering away. 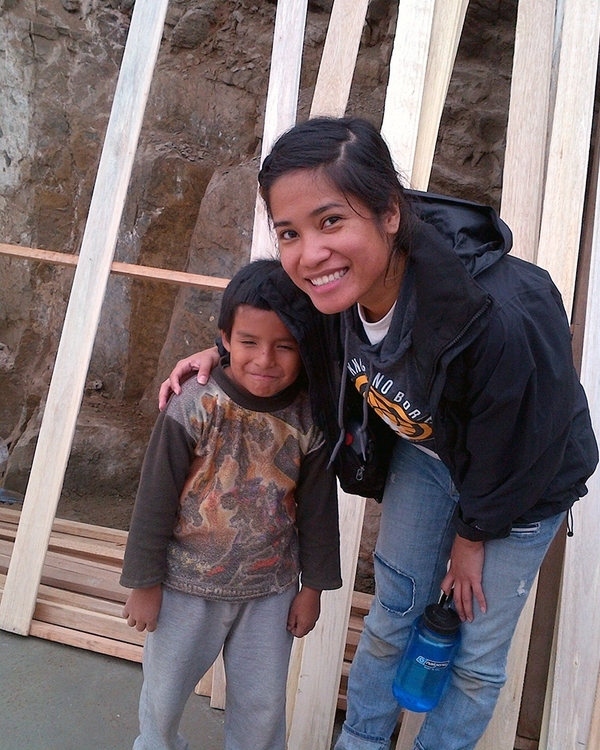 Guided by two “maestros”, we began assembling the perimeter walls of two of the homes. Using tongue and groove wooden slats (which we carried to the sites ourselves), we added one after the other along our wooden frames. A few of us also accompanied our priests as they visited homes throughout Laderas. The women of “el comedor” were our guides who brought us to the sick and infirmed, the elderly and many families that welcomed us with warmth and generosity. We are reminded now more than ever that “neither he who plants nor he who waters is anything, but only God who gives the growth”.